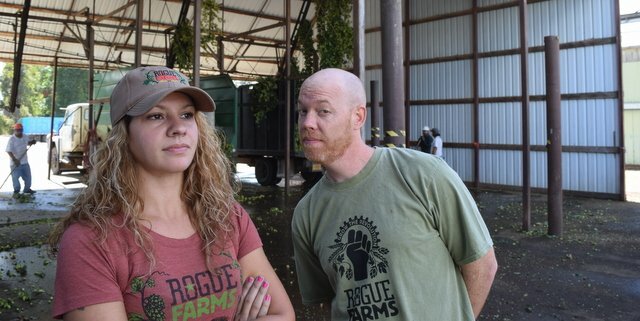 In early September, we get lost in the bines at Rogue Farms for hop harvest season (yes, Rogue actually grows a good portion of its brewing ingredients). We actually wrote some cool stories about it, took some fab photos and even made a video. Last week, Rogue Ales and Spirits released its own mini movie on its 2016 hop harvest, and as you can see above, it’s beautifully filmed. This quick one-minute vignette shows how hops are planted, grown, picked, dried, cooled and driven 42 acres from Rogue Farms in Independence, Ore., to Rogue world headquarters in Newport, Ore. To experience the eight varieties of hops grown at Rogue Farms, we suggest you try the brewery’s 8 Hop IPA, which is on taps and shelves across the country right now. In fact, grab a few for us too. Then meet us here. Borisav Radojkovic liked this on Facebook.